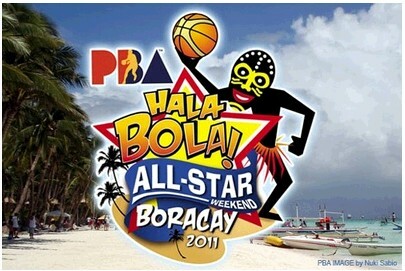 The PBA Hala Bora All Star Game in Boracay Convention Center is just around the corner. On May 18 there will be parties for the arrival of PBA stars in Boracay and on May 20 there will already be side events such as the obstacle challenge, and the Rookies vs Sophomores Blitz Game. Then on May 22 the most awaited event, the North All Stars vs. South All Stars game will happen. The PBA can't wait to show their love to their fans in Boracay. The informations that I got here came from PBAaddicts.info. “Just about everybody who hears that it’s going to be in Boracay is excited to be there. Emphasis is on our outreach programs. We’ll also hold a beach party where our players will mingle with the local and foreign tourists. This is one way of helping promote the country’s tourism program." Just a little recap, last year The North All Stars beat the South All Stars, 133-130. That was in Puerto Princesa, Palawan, the hometown of Rico Maierhoffer. Gabe Norwood was the All-Star Game MVP. Can they make a repeat of that kind of performance on May 22, 2011? To be sure, let's take a look at the line-ups. "Derby Ace’s Marc Pingris and Kerby Raymundo and Ginebra’s Mark Caguioa and Willie Miller. The reserves are Alaska’s LA Tenorio, Meralco’s Mark Cardona, Talk n Text’s Ranidel de Ocampo and Harvey Carey and San Miguel Beer’s Rabeh Al-Hussaini, Arwind Santos and Alex Cabagnot. Their coach will be Ato Agustin, San Miguel's head coach." "Derby Ace’s James Yap, the player who drew the largest number of fan votes, banners the South team along with Jay Washington of SMB, Kelly Williams of TnT, Eric Menk of Ginebra and Cyrus Baguio of Alaska. Coming off the bench for the South team of coach Chot Reyes are TnT’s Jimmy Alapag, Derby Ace’s PJ Simon, Meralco’s Asi Taulava, Air21’s Dondon Hontiveros and Danny Seigle, and Alaska’s Joe Devance and Sonny Thoss." Both teams are quite equal with regard to height and firepower but I can see a difference with regard to the versatility in the power forward and center position. The North All Stars have Ranidel De Ocampo who can shoot threes and who can defend well. I guess he will make a significant difference in this game. I'll go for the North All Stars. They will win it again. Intal, Ronald Tubid, Elmer Espiritu and Rey Guevarra." "Mark Macapagal takes a shot at a second straight three-point shootout title against a crack field including former winners Jimmy Alapag, Dondon Hontiveros and James Yap. Also entered in the three-point shootout are Mark Cardona, Joe Devance, Ronald Tubid, Ronjay Buenafe and Sunday Salvacion. The top three in this event will challenge legends Alvin Patrimonio, Ato Agustin and Allan Caidic in a special shootout." "Vying for the Obstacle Challenge plum are title holder Jonas Villanueva, Alapag, Buenafe, Cabagnot, Miller, Tenorio, Chris Ross, Josh Urbiztondo and Sean Anthony." That's the full schedule of events in the 2011 PBA All-Star Game in Boracay. Again, the side events, i.e. 3 point shootout, obstacle challenge, and rookies vs. sophomores game will be on May 20 and the main event, the All-Star Game will be on May 22.